For more than 400 years, humanity has been pointing telescopes skyward, peering into the depths of space to ask fundamental questions about the nature of the universe. Even today, many of those essential questions remained unanswered. Arizona State University has joined an ambitious project that seeks to solve some of the biggest mysteries. The Giant Magellan Telescope Organization (GMTO) is an international consortium of universities and institutions dedicated to building the largest, most advanced optical telescope to date. The Giant Magellan Telescope (GMT) will give us a closer look at the first stars and galaxies to ever exist. It will also help us understand planets outside of our own solar system — including ones that could support life. RELATED: Q&A: What can we learn from the world’s largest telescope? 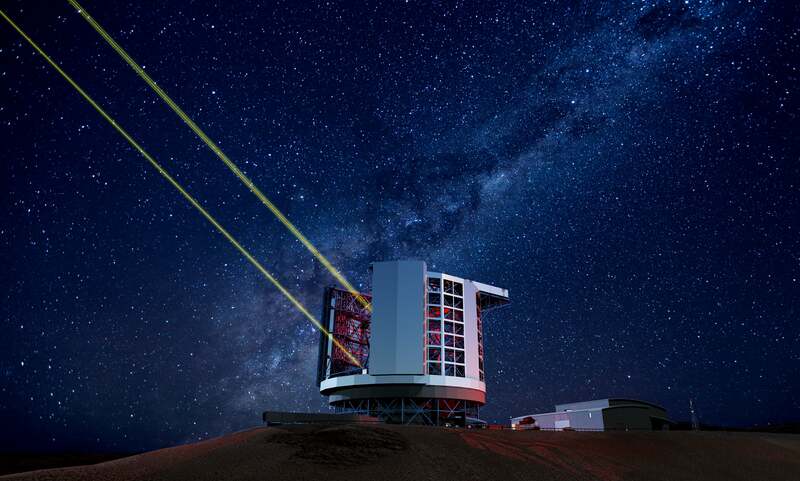 Destined for Las Campanas Observatory in Chile, the GMT is slated to be the first completed telescope to qualify as an “extremely large telescope” — defined as an optical telescope whose mirrors measure between 20 to 40 meters across. Upon planned completion in 2026, the GMT will boast an optical surface of 24.5 meters in diameter, which is a little longer than a bowling lane. Earlier this month, the telescope’s fifth of its seven mirrors was cast from borosilicate glass melted in a 2,100-degree rotating oven at the Richard F. Caris Mirror Lab. This gives the mirrors a parabolic shape as they cool over a three-month period, which saves time on polishing. The GMT’s mirrors will be arranged like lotus flower petals. Six circular off-axis mirrors, each weighing 17 tons — as much as two large elephants — will surround a central, on-axis mirror. Each mirror will be coated in a layer of aluminum just a few atoms thick to create the all-important reflective surface. These enormous mirrors are expected to achieve a resolving power 10 times greater than that of the Hubble Space Telescope in the infrared region of the spectrum. The GMT’s location will bolster its ability to collect light and high-resolution images. Sitting atop Las Campanas Peak at approximately 8,200 feet, the observatory will be situated in one of the driest places on Earth and will enjoy clear, dark skies for more than 300 days a year. Citing the uniquely interdisciplinary nature of ASU, Elkins-Tanton believes that SESE is well-positioned to contribute to the GMT’s mission and benefit from the data it will collect. For instance, Rogier Windhorst, the co-director of the ASU Cosmology Initiative, anticipates that the GMT will enable him to expand his work on early stars and galaxies and open the door to the characterization of the first astronomical objects in the universe. Windhorst, a Regents’ and Foundation Professor, is also a team member on NASA’s James Webb Space Telescope, slated to launch in 2019. Space telescopes such as Webb and its precursor, the Hubble Space Telescope, excel at taking stable images and finding objects. But ground-based telescopes such as the GMT will comb through and analyze the light emitted from these objects, according to Windhorst. “In this way, Hubble and James Webb find the candidates, but the big ground-based telescopes do the more detailed work in terms of spectroscopy and finding the elements for life in the atmospheres of these planets or characterization of the light from the first stars and galaxies,” said Windhorst, who will discuss next-generation telescopes at the New Discoveries lecture Thursday in Tempe. The suite of instruments planned to accompany the GMT will aid this analysis. Evgenya Shkolnik, an assistant professor of astrophysics, can’t wait to get her hands on some of the telescope’s spectrographs. They will help her study the atmospheres of exoplanets — planets outside our own solar system. She also studies the stars they orbit and how they interact with each other. Currently, researchers are limited to a scarce few observations of these far-flung exoplanets and their stars. The GMT will allow Shkolnik and others to view many more exoplanetary atmospheres and to do so faster, thanks to the telescope’s massive collecting area. “We don’t have to stare at them for quite as long because you get many more photons with such a big telescope. So in the same amount of time, we’ll be able to get many more observations of many more planets, which means we could start doing statistical analyses on the differences from planet to planet,” she added. A focus of Shkolnik’s research is red dwarf stars. Though they’re one of the most prevalent stars in our galactic neighborhood, red dwarfs are difficult to observe. Because they are only half the mass of our own sun, or less, they emit much less light and infrared radiation. According to Shkolnik, even if two stars are the same distance from Earth, the one lower in mass will be far fainter, sometimes as much as a thousand times so. “I’ve used many telescopes all over the world. I would definitely say that in all cases we run up against observing limitations, because everyone wants to go fainter or higher resolution than we can, and that’s something that the GMT will win over in spades,” she said. Thanks to the high angular resolution of the GMT — or the ability to differentiate faraway objects situated close together — and the telescope’s high spectral resolution instruments, Shkolnik and her fellow researchers will be able to closely examine planets in red dwarf systems, such as Proxima Centauri and planets similar to the TRAPPIST-1 system of seven planets. Elkins-Tanton, a geophysicist and planetary scientist, is particularly interested in rocky exoplanets, such as those orbiting Proxima Centauri and TRAPPIST-1. Perhaps even more intriguing than understanding the makeup of these Earth-like worlds is the possibility that they could support life. Associate Professor Patrick Young, a theoretical astrophysicist, is most enthusiastic about the telescope’s implications for his work in astrobiology and planetary habitability. These types of revelations also hold promise for Young’s work as SESE’s associate director of community outreach. Direct imaging also opens up possibilities for researchers who work outside of optical telescopes, such as Judd Bowman. Bowman, an associate professor of astrophysics, is optimistic about how the GMT may complement his work using radio telescopes to study the gas that surrounded the first galaxies. While optical telescopes gather data from light waves, radio telescopes collect light with wavelengths measured in centimeters or even meters. “This combination is critical for understanding stellar evolution, the role of black holes and the formation of galaxies in the early universe, as well as the evolution of the universe as a whole,” Bowman said. In fact, the marriage of radio and optical observations was one of the reasons he was excited to join ASU in 2010. “I wanted to be part of a team with leading early-galaxy observers, like we have here at ASU. Now with GMT under construction and our radio telescopes beginning operations as well, we are about to start that great new era,” he said. Though the GMT holds great promise for an expanded understanding of our universe, such advancements require collaboration from its host of partner institutions. The opportunities presented by that level of teamwork was one reason Windhorst was keen to get ASU involved. ASU is the 12th member of the Giant Magellan Telescope Organization, which includes Astronomy Australia Ltd., the Australian National University, Carnegie Institution for Science, Harvard University, Korea Astronomy and Space Science Institute, the São Paulo Research Foundation (FAPESP), Smithsonian Institution, the University of Texas at Austin, Texas A&M University, the University of Arizona and the University of Chicago. Top photo: A rendering of the Giant Magellan Telescope at night. Image courtesy of Mason Media Inc./GMTO Corp.